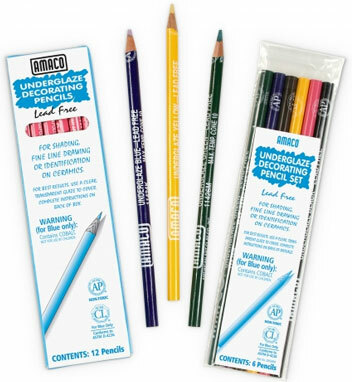 Underglaze Decorating Pencils are ideal for shading, fine line drawing or identification. Apply the underglaze pencil to bisque ware to create a variety of unique decorative designs. After decorating, dust lightly with a brush to remove excess particles. Unlike regular pencils—care must be taken in sharpening Underglaze Pencils. Do not use a pencil sharpener. It is best to sharpen them with a knife or blade. The maximum firing temperature is Cone 10 for Blue, Black, and Green, Cone 5 for Brown and Yellow, and Cone 05 for Rose. Artisan glaze pencils fire at any temperature range, up to a maximum of Cone 10 (2350 degrees Fahrenheit). Lead free.